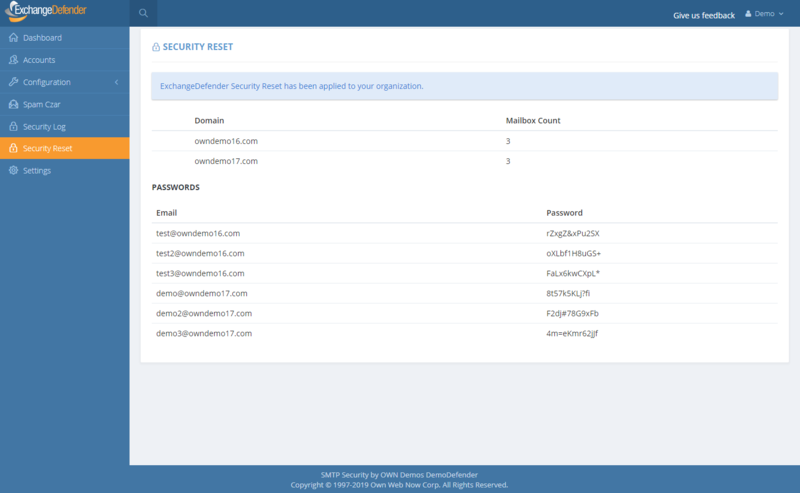 ExchangeDefender has always been a great friend to the SMB community where folks hate passwords and password complexity right until the moment their password gets compromised. Once that happens, it’s up to the MSP or poor IT guy to sit around and reset all the passwords in the organization. As mentioned previously, a number of ExchangeDefender Enterprise features is being delivered to ExchangeDefender Pro so now you’ll have the ability to reset every single users password quickly. Under the domain login you will now see a “Security Reset” link that will allow you to either randomly assign a strong password (smart) and send your users a reset link or pick the same password for all users (outright idiotic but “business requirements”). Just a word of warning: If you select to send your users a new password in clear text, and show the roster with the plain text password on the next page, for whatever ungodly reason, please add a note to come back later and lock your users down. Most MSPs keep the same password for ExchangeDefender and Exchange, and these services also affect ExchangeDefender Encryption, LiveArchive, WebFileShare, Compliance Archive, eDiscovery, FailPOP, mobile, etc and leave you open for collateral damage. Unless you’re using 2FA/OTP, restricting IP address ranges, rotating passwords frequently, I can guarantee that your passwords will be compromised. Please, please, please don’t do this, we are only making it available as the feature of last resort. 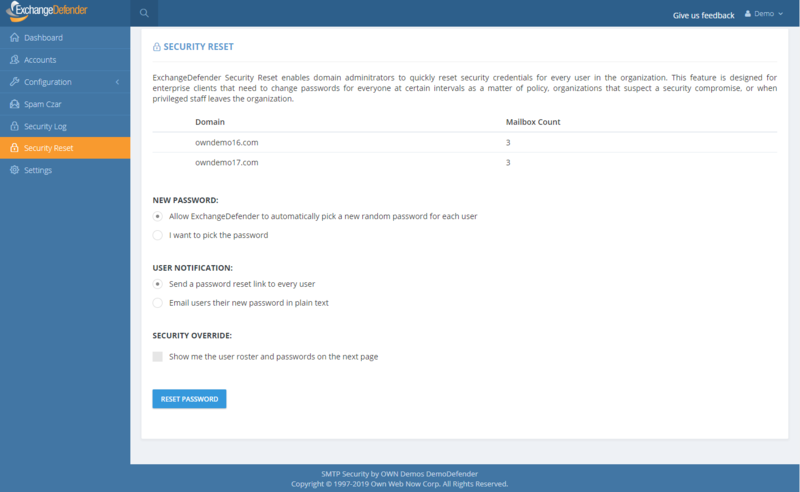 As we add these advanced security controls into ExchangeDefender Pro (and some even for Essentials) we will be tightening the security of the platform around. To hear more about our plan for 2019, please sign up for the webinar on February 6th at noon EST. Click the banner below to reserve your seat.